There’s so much to say about these amazing masques, but I’ll make it quick! I’ve been using both the face & eye mask for months now and the results are beautiful! Because I’m trying to make each of these products last as long as possible I use them 1x-2x’s a week before bed, but if I had unlimited funds, I’d absolutely use both masks every single night! As mentioned in last week‘s post, my skin has been drrrry and Aveda Tulasara’s super duper hydrating formula is a miracle worker! By morning my skin looks brighter, more even, firmer and the eye masque diminishes the appearance of the dark circles under my eyes. 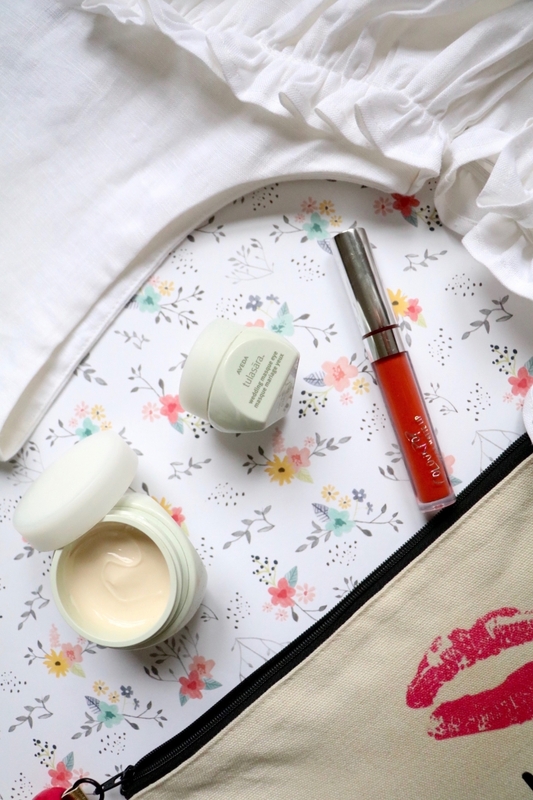 Love the thought of waking up to skin perfect enough for your wedding day on an regular basis?! You definitely want to check these masks out! Learn more about these awesome products & their amazing ingredients here. Great white tops are my obsession all year round and our Lila Top is my ultimate pick for the season! There’s something so fresh, whimsical and feminine about this layered linen top with gorgeous off the shoulder ruffle sleeves. It’s straight out of a dream! White tops pair so well with virtually any bottoms in any color & that’s one of the many reasons this cutie is too good to pass up! Pair it with these fun and chic rust wide leg sailor pants, take it down a notch with our favorite mojo skinny jeans, or keep it casual with our new high roller denim shorts. My first Colourpop product ever & it’s a goodie! This burnt orange lipstick is very pigmented, long lasting & not AS drying as other liquid lipsticks I’ve tried. Yesterday was the first day I had worn Mama for a full-day and after eating and much chatter, I checked in on my lipstick a couple of times thinking I needed a reapplication. To my surprise, I didn’t need to touch up at all! By 7pm, I did experience a bit of dryness and had to clean up my lipstick a bit (but not reapply) to get rid of a little flakeyness that did occur, but I have to say– for the price and for how long I wore the product without having to add another layer of lipstick–it’s really darn good! I’ll have to check out the the Tulasara mask and eye cream! I’ve actually been looking for an eye cream – I’ve never used one before but I feel like I’m getting to the age where I need to step up my skincare regimen. I have to bite the bullet and buy that Aveda Eye Masque! I’ve been dying to try it. I love it so much and look forward to the nights when I use it!! Mama is such a fun color! I haven’t tried anything else from colourpop but have a few super shock shadows in my cart 😉 Although, I shouldn’t be buying ANY shadows 😛 I may bite the bullet soon! Oooo, Lindsey! Thank you so much for the recommendations! I’ll keep them in mind for the future 😉 You’ve sold me! Oh my gosh those rustic wide leg pants are to die for! Love your style girl! That burnt orange lipstick is too fun! Okay first, LOVE the ruffled top!!? Second, I have what feels like a thousand Colourpop lipsticks including that color and it’s sooo stunning! Such a good deal for a lipstick that lasts pretty long. I’ve been putting off trying Colourpop for so long because I’m always so overwhelmed by the selection on their website. This might be the final push though. I’m going to have to just dive in! That cold shoulder top…. in love. I love the idea of tops like that because I can still wear a bra, while not just wearing a plain old top. I love this look!! The mask is SO DARN GOOD & hydrating!! I also have very dry skin and am always looking for new products to try out for this. I’m also getting married next year;) I’ll definitely be buying the eye and face masks to try out! Great recommendations! You’re style is so cute! Want to try that Mama lippie! Aww! Thank you, love! 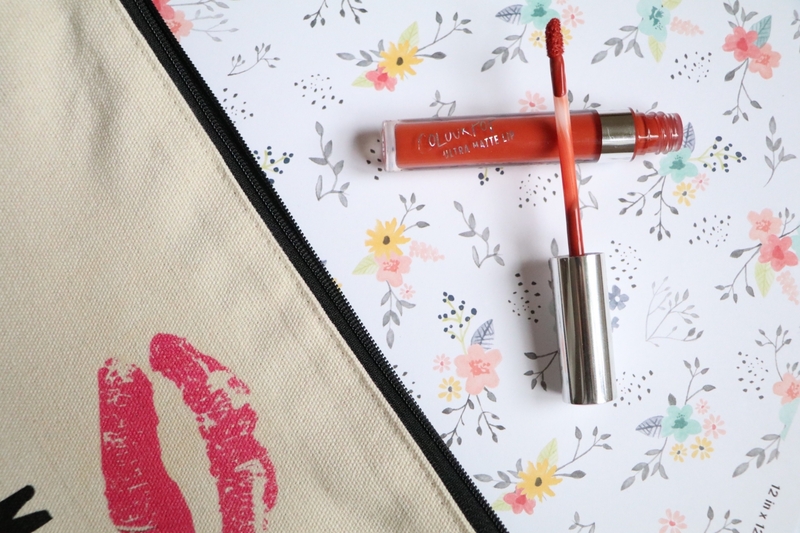 That mama lippie is SO pretty & different from other orange-y shades I’ve come across! It’s so true! I’ve been discovering lots of affordably priced beauty items that work great!